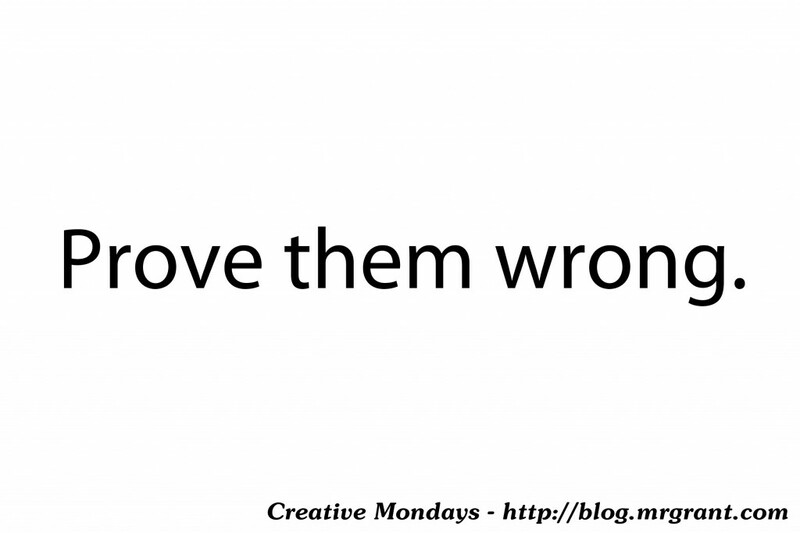 Creative Mondays #032 – Prove them wrong. If there’s one thing all creative folks have in common, no matter what their chosen artistic field is, it is that you will have your fair share of naysayers. People who tell you the creative goal you have in mind just simply cannot be accomplished. These people will, to your face, tell you that what you are doing isn’t going to work. Or that your creative goals are unattainable. Now I’m sure there’s a deep psychological reason why these people do this. It could be jealousy, just plain meanness or any number of other things. I think these people are the absolute worst kind of people to have around because what they are doing is killing creativity. They are stomping on your dreams. Killing your confidence. They are, unfortunately, all around us and they can even be lurking amongst those who we consider our close friends or even our family. People will tell you to ignore the naysayers and I agree. Ignore them. They should be meaningless in your artistic career. But I say do not just ignore them, use their naysaying to propel you even further down the path to your creative dreams. Prove them wrong. The feeling of proving someone who doubted you wrong is a feeling that can only be eclipsed by the feeling of producing a piece of art. I love proving naysayers wrong and it’s something I developed at a young age. I remember I was taking a theatre management class in college and the teacher had us do some writing on a project. I forget exactly what the project was focused on but at the end when the teacher went over what we had written, he pointed out that two of us in the class had written about that there would be no greater feeling of satisfaction in our careers than to prove the naysayers, the people who said we couldn’t accomplish what we wanted to accomplish, wrong. It was at that moment I knew that I was not alone in my thinking that way. There were others out there too. This was proven again to me wham I heard the song Acceptance Speech by the band Friendly Indians. In the song, the singer warns all those who crossed him to get ready to grit their teeth when he steps up to the mic to make his acceptance speech. This song clicked with me from the first moment I heard it and, to this day, I will listen to it to focus me back on the path getting creative work down and proving the naysayers wrong. Also, this may be a good tactic to try if the main naysayer who is holding you back is you! If that’s the case, prove yourself wrong. Show yourself that the things you want to do can be done. If you do that enough, you’ll stuff your own personal naysayer back down where he or she belongs! I will offer this one bit of warning, however. You don’t want to dwell on the negative things that people say about your creative goals. That’s a great way to rev up the old negative brain and that will not serve you at all. I’ve talked about the negative brain before on in this blog, but if you’re joint us late, once the negative brain is ramped up, it’s hard to shut down, so don’t let the naysayers get you going in that respect. Only use their naysaying as fuel to propel you further towards accomplishing your goals. How do you deal with naysayers? Is there a better way than plotting to prove them wrong? If so, let me know in the comments below. Have a great week! 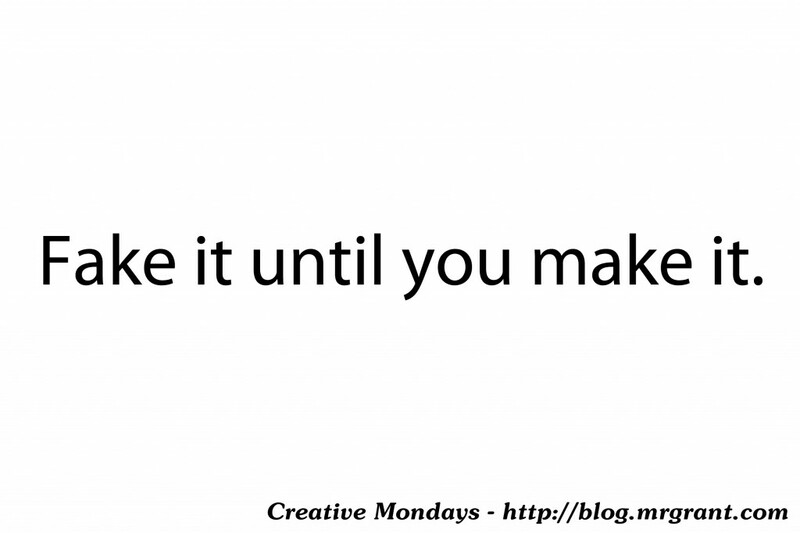 Creative Mondays 022 – Fake it until you make it. More and more, recently, I’ve been hearing the phrase, ‘Fake it till you make it.’ It’s popped up in discussions and on the radio in news stories and there’s a very famous TED Talk by Amy Cuddy that explores the concept of ‘faking it’ until you ‘make it’ in terms of body language and success. (It’s a good watch, and I’ve linked to it at the bottom.) I have heard it so much, I thought it might make a good topic for a Creative Mondays post. I agree that faking it until you make it is a good practice, with a few exceptions. You never want to flat out lie to people, especially people who may give you a job. This can come back to bite you in the hinder so bad, it’ll make your head spin. But, I do feel it’s okay to, shall we say, stretch the truth a bit, if you are confident that you can handle the end result and back up your promises. I have a prime example of what I’m talking about in something that happened my freshmen year of college. Now, while freshmen were told that they should audition for everything that came along, they were told they shouldn’t expect to get in plays their freshmen year. Well, in my first semester of my freshmen year, I landed the bit part of Jaques DuBois in Shakespeare’s As You Like It. If you have read the play you know that the character comes in at the very last minute of the play and, sort of, ties up all the loose ends. It was a tiny part, but I felt totally badass because I was a freshmen who had landed a role in a University Players production. When the second semester rolled around, I was feeling cocky and I decided that I was going to get a bigger part in a play. Auditions for YOU CAN’T TAKE IT WITH YOU came up and after reading the play I started to think of who I could play in the play. I decided I was going to go out for the role of Ed. If you are unfamiliar with the play, it is about an eccentric family full of ‘nutballs’ who all have their weird hobbies. One of Ed’s main hobbies is playing the xylophone. On the day of the audition, as I was filling out the audition sheet, there was the question: Can you play the xylophone?. Now, I did not know how to play the xylophone. No idea whatsoever. But I was a drummer all four years of high school and I had been around xylophones enough to know a little bit about them. So I just wrote down yes on the audition sheet. Now, let me say, this could have backfired HUGE on me. I could have walked into the room and there could have been a xylophone sitting in there and they could have asked me to play. Luckily, that did not happen. I went in, did my monologue and spoke to the director for a bit and just as I was leaving he asked, “You can play the xylophone?” I said, confidently, “Yes.” He nodded, said okay, and thanked me for coming in. A few days later when the cast list was posted, I had landed the role of Ed. Of course, this meant that I now had to learn how to play xylophone, which I was able to do, at least well enough for the play and no one was ever the wiser. If you can confidently ‘fake it, until you make it’ I see no problem in doing it. I certainly wouldn’t tell someone I could fly a plane if I couldn’t, but I was confident I could pull of playing xylophone enough for this play, so I saw no problem in stretching the truth a bit. ‘Faking’ it, if you will. It got me the part. So, it is quite possible to ‘fake it until you make it’ in our creative lives. Just make sure you can confidently learn to play the xylophone if you say you can. Has there ever been a moment in your creative career where you had to ‘fake it?” Let us know in the comments below! Have a great week!